Covering the last few weeks, which started off pretty quiet, so let’s see how this goes as a monthly post. But I’ll post on V/Line issues and elevated rail separately. This seems to have been pretty good in the first few weeks. Overnight/early morning services on the 2nd and 3rd of January reportedly attracted about 10,000 touch-ons, which is about three times the use of Nightrider on a weekend in 2015. So off to a good start, though a long way from where you’d want it to be on an ongoing basis. The second weekend (9th and 10th of January) the government says 15,000 people used the services, so around five times a Nightrider weekend… bearing in mind the weather in October generally isn’t as nice as in January. …and it was unclear where Nightbus 978 ran during the closure of North Road for level crossing works, with no information online, no signage up at stops, and the operator apparently unaware it was happening. Overall though it seems Night Network is off to a good start. What will be interesting to see is how the government tweaks it to improve the service and its cost-effectiveness. Extensive works at Port Junction to install platform tram stops (and, it appears, upgrade track and overhead wire along Clarendon Street) ran overtime earlier in the month, with routes 12, 96 and 109 continuing to be replaced by buses for some of their length for an extra day or two. Apart from running about a day overtime (which as I understand was due to a workplace safety issue), unfortunately what let it down was the bus replacement routes. 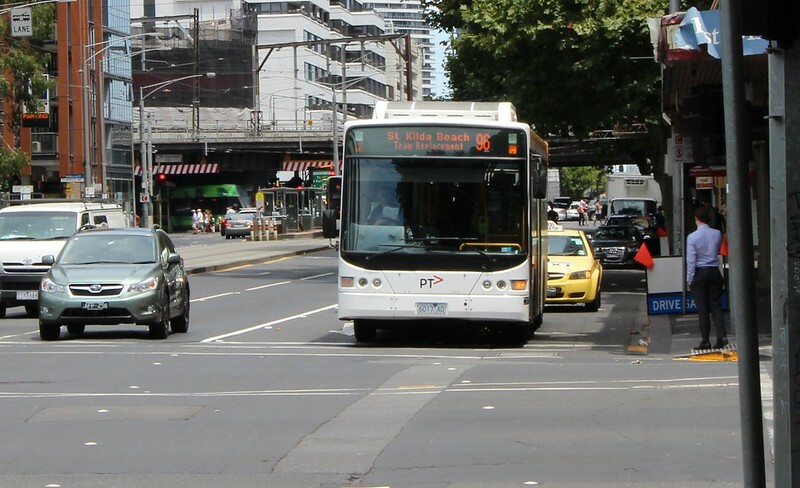 I unhappily experienced the tram 96 buses one Friday afternoon, on my way to Albert Park. The tram terminated at Batman Park, just south of the river. From there we had to walk back to Flinders Street, then wait for a bus, which we piled onto. From there it did a U-turn east down Flinders Street, left into King Street, right into Flinders Lane, right into Queen Street, then across Queensbridge, south past the Casino and then right into City Road, then under the tram 96 bridge and left into Ferrars Street and finally able to parallel the tram route from there. There was heavy traffic, which could be reasonably anticipated on CBD streets, so it probably added half an hour to the journey, which is pretty horrible for a short trip. In retrospect it would have been quicker to walk from Batman Park south to the temporary route 12 tram terminus at City Road and use the 12 from there, but that information was sadly lacking. It beats me why they came up with such a poor bustitution route, particularly outbound. I’d have thought taking the Charles Grimes Bridge and Montague Street would be much quicker, at the possible expense of missing the City Road stop by a couple of hundred metres. There’ll be plenty more of this kind of thing as more tram stops get upgraded for level access. They really should do better. 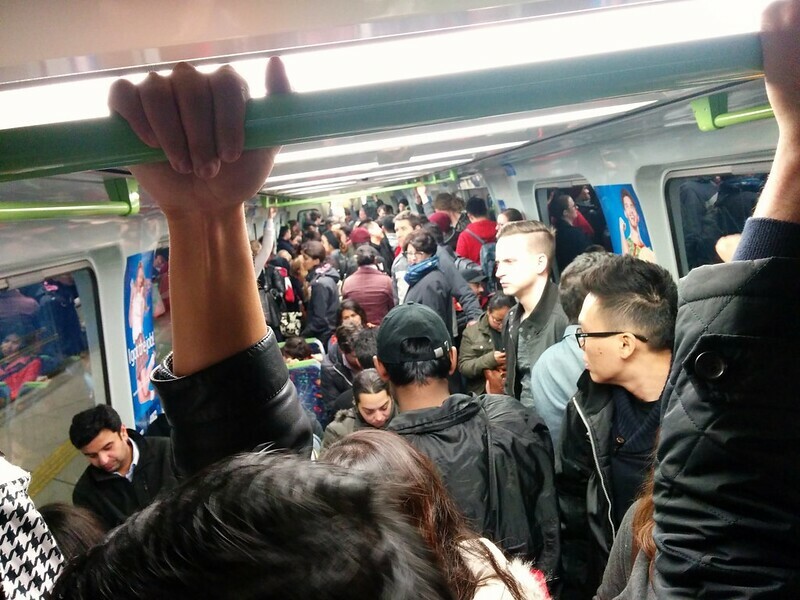 The Greens FOI’d the raw data from the PTV Metro load survey from May 2015, claiming that the government had understated crowding, because figures during cancellations and long delays are filtered out. The figures perhaps have no real surprises: the strongest train passenger growth is in Melbourne’s growth corridors to the south, southeast, west and northwest. As for the massaging of data, I think it’s valid to look at the raw data, and the extra attention on crowding issues was welcome, but it’s also important to remember why the load surveys exist in the first place. They are not to measure crowding for the sake of measuring crowding. They’re to use as a planning tool to work out where and when to schedule extra trains. We don’t need a survey to tell us that crowding occurs when there’s a cancellation. That’s obvious — and it’s a different problem — one of service reliability (which might be improved by better maintenance, more resilient infrastructure, stabling security, etc). The primary point of the load survey is to say: when the network is running more-or-less to time, where is there still crowding/unmet demand? Which lines need more services — and thus, investment in fleet, stabling, better signalling, upgraded power supply, and so on? Punt Road to become a 24 hour clearway. I suspect it’ll have some short-term traffic flow benefits. Long term? We’ll see. It’s better than widening the road. Long term a boost to the 246 bus (including bus priority) and nearby routes would help. The government statement claiming it would improve things for people driving to the footy is a bit odd. “When you go to the footy finals this year, you’ll no longer be frustrated by being stuck behind a parked car on Punt Road.” — yeah, you’ll be stuck behind a stopped car instead of a parked car. And why would we want to encourage people to drive to the footy? Also a bit odd is the idea of a 6 week consultation period, after which they’ll go ahead and do what they’ve already announced. ← Previous Previous post: Bustitution part 1: is it free, or not? thanks for the update. January is meant to be a quiet month in PT, but not so far this year. I can’t understand why citizens need to put in an FOI to get basic transport performance data. Should all be available on PTV website. I believe the consultation period for Punt Rd is to figure out new parking spaces for people who are affected, not to ask them how they feel about it. There are plenty of people doing surveys about night network at Flinders St, presumably for PTV. I was not interviewed as I work for railways and was in uniform. Fair enough. Looks like Metro will start doing maintenance works 9:30 pm till next service in morning Mondays to Wednesdays to compensate for night network. Means there will be bus replacements regularly during the week at night. On the positive 9.30pm to 4.30 am should give plenty of time to actually do maintenance. do you know where the boundary is for the load surveys? From memory, on the Frankston line, it was Caulfield? If so, this is grossly underestimating the scale of the problem. Passengers from MATH stations have upto 25mins on-board for a trip to the city. Their discomfort should not be dismissed. There are similar examples on other lines too. @Roger, PTV does publish the report. See the link in the blog. Whether or not the raw data should be routinely released is really a separate question. @Wayneo, thanks, that makes sense. @Gorks, good point about the changes to the maintenance window. This has been publicised via newspaper ads. 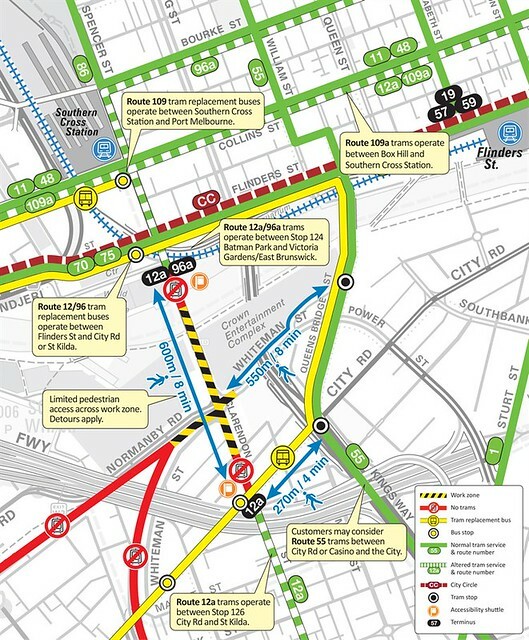 @TK421, the boundary is the “city cordon” stations: Richmond, Jolimont and North Melbourne. Some separate surveying takes place at South Yarra, Caulfield, and even stations further out, but the load surveys use data gathered just before trains reach the city. I suppose Myki touch ons/offs are the main source of data for non-CBD trips? The load surveys are interesting, but do they actually trigger any action? It seems that since additional peak services are expensive and have to be budgeted for, they tend to be added on a political basis, or where spare capacity is available. Not that there’s anything necessarily wrong with that – service increases are good – but no real action seems to be triggered as a ‘breach’ of load standards would imply. @Campbell, I think the answer is yes, but the wheels of government turn very slowly. For instance, look at the Werribee line. Load surveys for years have shown this line to be overcrowded. Initially last decade they boosted services; then they moved Werribee trains out of the Loop to allow a further boost. Then they spent $100m on the Laverton rail upgrade to allow separate Altona Loop shuttles and a more Werribee direct services. (An unfortunate side-effect of this is Altona Loop got a degraded level of service.) Remember, all of this is in Melbourne’s west, on a line which does not cover marginal seats. There’s now a (main line) Werribee train about every 10 minutes in peak, roughly double what it was 15 years ago. Meanwhile, RRL: load surveys provided evidence of crowding on the Sunbury and Geelong lines, and RRL benefiting those plus Werribee and others helped make it happen. The subsequent use of that capacity hasn’t come about yet on the suburban lines, but that’s entirely another story. Likewise, I doubt we’d see the investment in E-class trams at present if the tram load surveys hadn’t shown persistent overcrowding on many routes, though providing a low-floor fleet is also important because of DDA targets. Train and tram load surveys have also provided part of the impetus for the metro rail tunnel. As for Punt Road, there needs to be a decent improvement in public transport. Replace car parking with a bus only lane, and operate buses every 5 minutes in peak hour. Do you have loading data for the Geelong line after the RRL project?